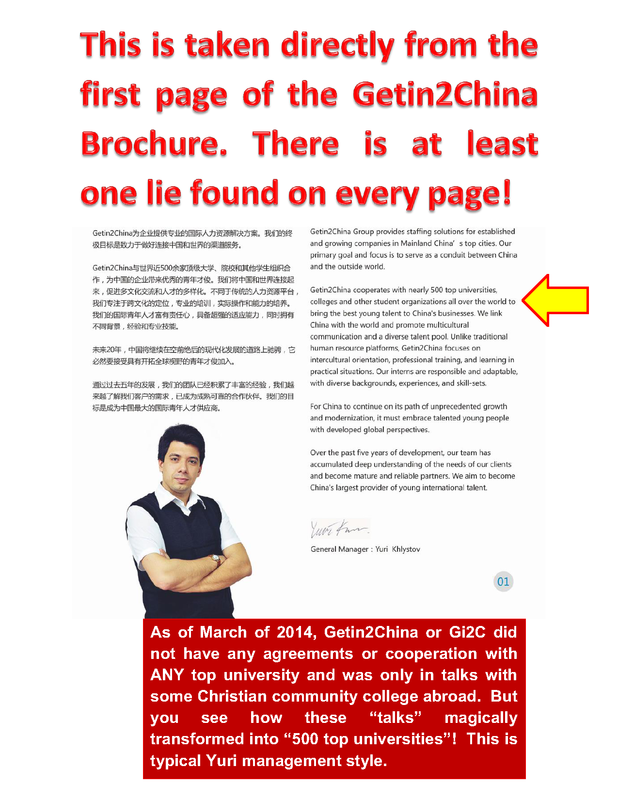 Why won't Gi2c and Laowai Career Center in China answer simple and valid questions if they are not China job scams? 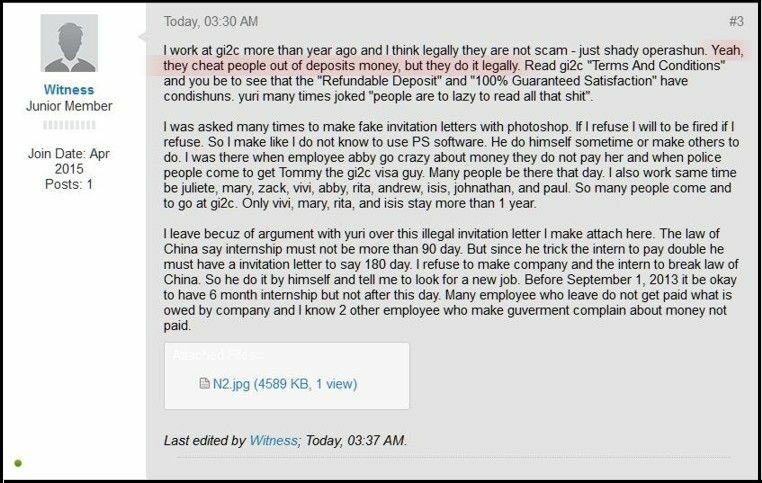 Subject: Why won't Gi2c and Laowai Career Center in China answer simple and valid questions if they are not China job scams? 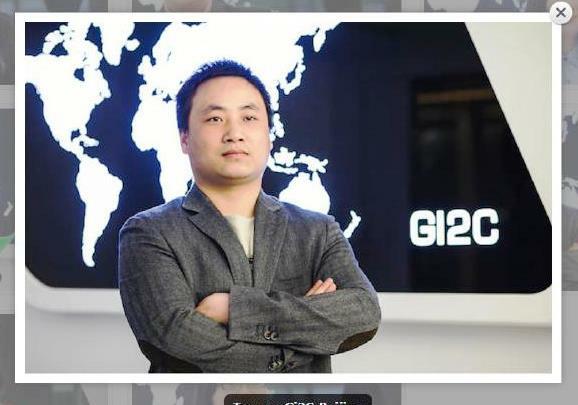 In recent months many people have made allegations against two companies based in China called Gi2C and Laowai Career Center which claim to have fantastic government, university, and Fortune 500 "connections" so that helping you find a great job in China is a snap for them. The two companies have the same Russian owner who insists all the "crazy allegations" about his companies being a scam are "baseless" and claimed at various times were created by an "envious competitor" and a "disgruntled employee". But he has never provided any details about neither the "envious competitor" nor the "disgruntled employee" despite being asked by China Scam Patrol at least five times over the last year. So the allegations continue and so do Yuri's denials. (1) What is your SAIC business license number for all 4 of your companies including Gi2c & Laowai Career Center? Chinese law requires that you have these licensed hanging in the reception area of your offices, but when I visited there, I did not see any. When I asked the receptionist where it was, she said she never saw it neither. (2) What is the taxpayer identification numbers of all 4 of your companies including Gi2C & Laowai Career Center? Legitimate companies pay taxes and have receipts to prove it. These receipts will have the name of your company and taxpayer ID number on it. (5) Do you deny that your former webmaster from the UK Steve Brown resigned in protest after he discovered you were making up fake jobs and fabricating job descriptions that you instructed him to upload on to your Gi2C website? (7) Why do you tell people that you can get them jobs and internships with Fortune 500 companies and MNCs (multi-national corporations) when you cannot and have not ever documented a single placement of any Gi2c or Laowai Career Center customer with a single Fortune 500 company in the last 7 years? (8) What is your office address in Beijing in Hadian District (at Zhongguancun) where your call-center is located and your executive office is located? Why do you try to convince people that your main office is 1,000 miles away from Beijing in Hangzhou where you share a small office with a language company? Are you afraid angry customers will come looking for you to demand a refund? (9) Why do you use 4 different companies to sell basically the same products and services? Why isn't one brand enough? Many people say that this is to fool people that these new companies are unrelated to the old ones that have so many complaints online. If this is not true, can we hear your explanation, please? 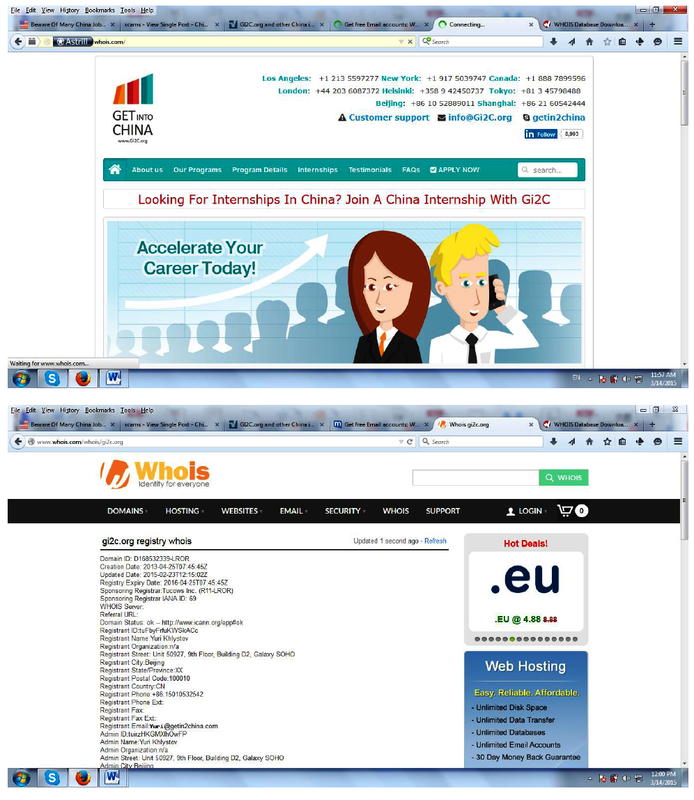 (The 4 alias companies are Laowai Career Center, Gi2c, Getin2China, and WiseWay Global Education). (11) Why did you tell three of your customers that they would work for Beijing's top FOREX firm FSI, but after they paid their money and arrived in Beijing, they did not work at FSI but sent to work at a tiny U.K. finance company called Montpellier which has a grand total of 12 employees. Andre D. from the UK claimed to be one of these bait and switch victims. Is he lying Yuri? (12) Why don't you tell your customers that they will have 1-3 roommates that may or may not smoke or do drugs when they arrive in Beijing. Don't you think it is misleading to tell people "you will be given your own apartment for free in China" but you do not tell them that this is only for the first 30 days? (15) Do you deny that you charged some people up-front fees as much as $3,799 and yet others paid nothing when you were being investigated and accused online? (16) Do you deny or admit that you hired a hacker to delete/hide negative comments about your companies online by corrupting, or "redirecting" the links to those comments? (18) Do you deny or admit having call centers in Pakistan and the Philippines calling people and pretending they were calling "from the London office of Gi2c"? (19) Why do your ads and sale people at Laowai Career Center claim the company is 10 years old when your website was created in 2014 according to whois.com.? (20) Is it true or false that "almost 40% of our clients asked for refunds" according to one of your former employees? I see that you gave two different explanations back in 2014 about similar fraud accusations made against another one of your companies called Getin2China. Back then you first claimed that some "envious competitor" was smearing you (but you did not identify the competitor) and then you changed your mind and said it was a "disgruntled employee" (but you did not name the employee). It is now 3 years later and the allegations continue. What is your explanation today in 2017 Yuri? We are all ears - after you answer the above questions. If you are legitimate as you claim, please answer these legitimate and valid questions many people are asking and they get frustrated when your salespeople keep changing the subject. We know, some of our volunteers pretended to be interested prospects and spoke with three of your "career counselors" (sales reps) recently. The conversations were "interesting" to say the least. Usually, when a company is falsely accused of a scam they will be outraged and quick to prove that they are not. But in the case of Gi2c and Laowai Career Center in China, both owned and operated by you Yuri Khlstov, there is only prolonged silence for six months (and counting) after the allegations began that your Gi2c and Lawai Career Center companies are both China job frauds. These accusations came via over 60 users at these web sites where their comments are easily searched (Some of the links to their comments are at the bottom of this post). But getting back to these unanswered questions... If these two companies are truly legitimate, then I must ask Yuri why you cannot publicly answer these questions and prove yourself to be legit and in full compliance with the law. 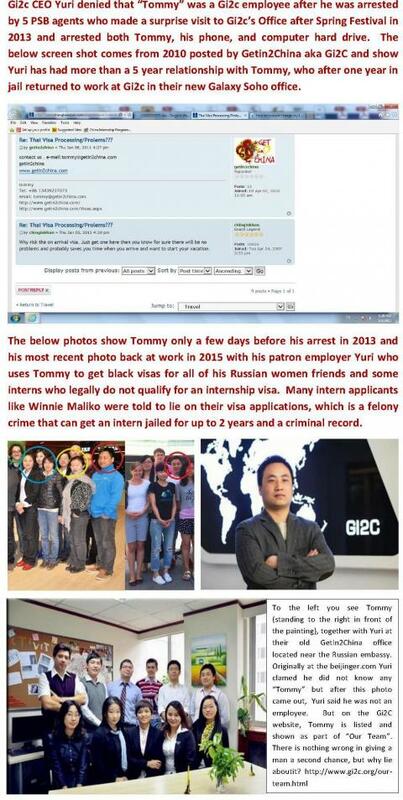 And if you believe any of the above is not true, I invite you to sue China Scam Patrol for libel or slander Yuri. We know who and what you really are and no amount of smoke and mirrors will even confuse us for one second. So long as you continue to "mislead" uni grads, we will continue to warn them. China is famous for what are called "Legal Scams" which sounds like an oxymoron but which is a reality in China because China's laws are still evolving and do not have definitions for laws that prohibit overseas telefraud of citizens of another country. But if Chinese citizens are defrauded in any way, there are indeed specific laws in place. So, until this legal void is addressed, many people exploit the huge legal loophole that now exists.